Historically, most people define “Engagement” at a site level using traditional analytics metrics like Session Duration, Page Views Per Session, Bounce Rates and others. And they’re right to focus on these metrics. Long-term improvements in these core measurements are and should be extremely important to site editors. However, there are many important and timely page-specific engagement questions that traditional analytics tools and metrics prove largely incapable of answering (and due to the limitations of the ways they get their measurements, won’t be able to answer). Are people sufficiently engaged with a page or is it just sitting idle on their browsers? How much of the page do people actually look at? Are people coming to the page and leaving quickly? Are people spending as much time on the page as I think they should? The chartbeat “Engagement” module, by design, provides site editors with the numbers needed to get greater page-specific insight. After pivoting on a page (by clicking on one of the articles in the “Top Pages” module), the engagement module that pops up on the left is broken up into three sections: Reading/Writing/Idle, Minutes on Page, and Scroll Depth. How long are visitors actually engaged on this page? Are people spending as long as they should on this page? Are people leaving the page too quickly (i.e. not sticking around after the 1st minute)? Are visitors seeing the whole article? Are visitors getting to important links and videos? What’s the best place to put ads? Getting a feel for these numbers, and recognizing when they are indicating unusual and actionable levels of engagement (positive or negative), should help editors figure out what they can do to take advantage of or fix “Engagement” abnormalities (and measure the results of those actions). Of course, there are many other quesitons to think about in addition to the ones we posed above and many other key insights to be extracted from the engagement module. But the most important point we wanted to drive home is that “Engagement” should not be thought of as purely a site-level concept, but that by using and understanding the power of chartbeat, it is possible and easy to understand “Engagement” at the page-level. P.S. For another interesting view of engagement, try clicking on the engagement module. Today we’re happy to unveil the latest gadget on chartbeat labs: Chartbeat for Google Chrome. It’s a Google Chrome extension that allows you overlay chartbeat data directly on your page, without having to leave your site. The chartbeat extension gives you the option of either seeing the page you are on or the site in full, with information about visits, referrers and engagement baked in. 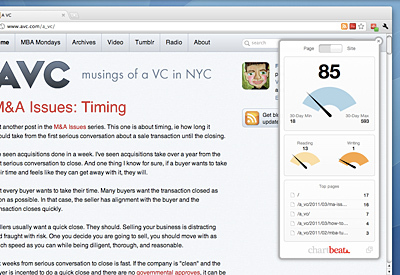 Once installed you’ll see a chartbeat icon to the right of your Location bar. If it has a little grey question-mark icon, then you need to log into your chartbeat account. Once you are logged in the icon will show you a green square if you are on a page that you have chartbeat access to, whereas pages that you don’t have access to will show you a red square. Enjoy and let us know what you think labs@chartbeat.com or twitter! For Firefox and Safari users we also have a bookmarklet version.